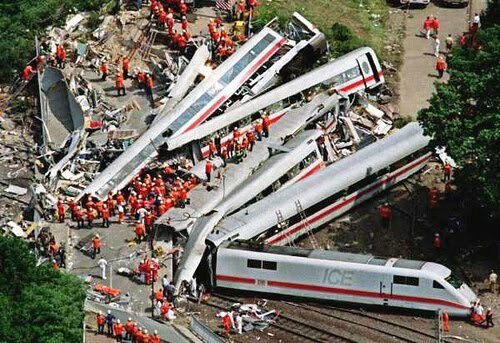 From January through November of 2010, the Federal Railroad Administration received some 8,050 reports of injuries and deaths among railroad workers, rail passengers and people crossing tracks in vehicles or on foot. Yet, while several Republican governors (namely Scott Walker of Wisconsin and John Kasich of Ohio) have turned their backs on Obama’s irrationally exuberant spending binge, including his envisioned high-speed rail system, Transportation Secretary Ray LaHood said the administration would press forward in a “patchwork fashion” if necessary. In other words – Safety, Supply and Demand, and Cost-Benefit be damned. Who cares what the citizens or governors want; LaHood, Biden and Obama know what’s best for all of us, right? I know, I know, “we can’t afford not to spend money that we don’t have.” Yeah, whatever! As stated above, during the first eleven months of 2010 there were 8,050 reports of injuries and deaths among railroad workers, rail passengers and people crossing tracks in vehicles or on foot. So in an effort to improve safety, the federal government is proposing to increase rail speeds from 60 to 80 miles per hour, to speeds of more than 200 mph. If it takes a 100 car freight train travelling 55 miles per hour over 1 mile to stop, one can only imagine how long it takes a passenger train travelling over 200 mph. In the famous Eschede rail disaster (pictured above), the train was only travelling at 125 mph, yet by the time a passenger was able to report that a wheel had fallen off, within seconds the train derailed leaving 101 persons dead and 88 injured. You may find a detailed listing of pre-1950 through January-2011 railroad accidents here. It appears that instead of addressing the current dilemma, the administration has once again taken the high road to solving imagined 23rd Century problems. Rail usage statistics reflect not only the “popularity” of rail travel (for example, in Japan) but also the geography of the country. “For instance, the United Kingdom is a relatively small, densely populated country where many more short journeys are made compared to a larger, much less densely populated country such as the United States. To gauge the true importance of rail travel, the number of journeys (however short or long) needs to be calculated. By this method one finds that the number of intercity rail journeys per year in the United States per inhabitant is so small as to be almost immeasurable. The U.S. figure is approximately 0.08 journeys per inhabitant per year, compared with the United Kingdom’s figure of 17.54 journeys per person. These statistics imply that Britons use the train 219 times more than Americans. So while perhaps high-speed rail would be important in counties like China, Japan, and the United Kingdom it will have very little impact in the United States. In other words, there is very little demand for intercity rail transportation in the U.S., in spite of the administration’s delusional scheme. Where I come from, that’s not exactly a smart strategy. Investing any money in any venture which lacks enough demand to recover said investment, along with a reasonable profit, is just plain foolish. While the U.S. has a population of roughly 305,000,000, the National Association of Railroad Passengers (NARP), a Washington, DC based lobbyist, can only boast in membership of approximately 23,500, representing a whopping 0.0077% of Americans. According to a May 2009 report in the Business Insider, a true national high-speed rail network would cost more than $500 billion. California is attempting to build a true high-speed rail line between San Francisco and Los Angeles capable of top speeds of 220 miles per hour and average speeds of 140 miles per hour. The environmental analysis report for the California high-speed rail had projected costs of $33 billion for just 400 miles. Meanwhile, the Midwest Rail Initiative had projected costs of $7.7 billion for 3,150 miles of moderate-speed rail. That’s $82 million per mile for true high-speed rail (partly because the California project goes through some mountains) and only $2.4 million for moderate-speed rail. All things being equal, high-speed rail will cost 10 to 12 times more than moderate-speed rail. Knowing this, the administration’s idea is to press forward in a “patchwork fashion” (i.e. Spend $53 billion here and there to get it started, and then beg for more cash every year). I guess it would be nice if we had an extra $500 billion to burn, and even nicer if there was any real demand to support the plot. But, maybe there’s a way to make this all work out after all. Perhaps like Obamacare, Obamarail could be funded by requiring every citizen to purchase a ‘mandatory’ seasonal rail pass. The government could even implement another “cash for clunkers” program, but this time when you bring in the old gas-guzzler for crushing, you get a discount on season rail passes. And if you are uncooperative, refusing to participate in the government’s mandatory rail program, you would pay a tax (but they would just call it a penalty). The government could even make the case that mandatory rail travel is covered under the Commerce Clause, because unless everyone buys a ticket, travel by high-speed rail would be cost prohibitive for the 0.0077% who really need to ride. The IRS could then be called upon to implement the enforcement portion by requiring that a unique national rail ticket number be entered on everyone’s income tax return. And to put the icing on the cake, the CBO could make wildly unsubstantiated claims about how Obamarail will save the nation trillions of dollars over the next century, or some nonsense. Yeah, well, I have an idea about how to save trillions of dollars in the future too. My idea involves not squandering the next $53 billion in present value dollars – today, but as stated above, “who cares what the citizens want”. When this despotic patchwork is complete, only then will we know whether it worked, but first, we have to squander $500 billion on Obamarail in order to find out. Imagine a nation where workers are able to take ‘shovel ready jobs’ hundreds of miles from home, to return once or twice per year via high-cost, oops, I mean high-speed rail, and you have China. The contention is that $53 billion is such a small price to pay for another patchwork adventure in government-side economics. In government-side economics, if the square peg doesn’t fit, then you hit it with a hammer, right? And if it still doesn’t work, then you simply go out on the campaign trail and convince everyone that it did. In spite of having over-spent by more than $3 trillion during the past two years, they surmise that their only failure was not having spent enough. Do you suppose that if the federal government borrowed and spent another $3 trillion it would do the trick? ‘Maybe next time it will be different! I mean, it’s not like the nation has a fiscal problem or anything.’ Face it, this isn’t supply-side economics, and it’s definitely not demand-side, so that leaves only one possibility; it’s a government-run bullet train to nowhere. This doesn’t sound like ‘winning the future’ to me. It sounds more like a bullet train to bankruptcy, or better yet, like ‘losing your future’. I mean the one in the near-term, in November of 2012. Are you ready for another shellacking? More on “Bullet Trains to Bankruptcy” and what really bankrupted Japan here. More on Bullet Trains to Bankruptcy – First Japan, and now China is going broke on their high-speed rail fallacy. Nice, let's build a high-speed rail system and then run empty trains 24/7 just to show how smart we are. China was banking on building a system in the U.S. in order to break even on their own system. Without exporting to us, they think they might breakeven by 2030. Right: Just like Japan didn't. While I do not necessarily agree with the Obama administration on many things I have to point out that, while your numbers may be accurate they also cannot be very relevant. There is a form of dishonesty here that is prevalent in our society. The fact that the U.S. rail network is old , outdated and hardly user friendly makes your numbers worthless as far as predicting how many people would actually use it and the numbers of injuries and deaths simply support the idea of upgrading and making them safer. I live in an area where I have never had the chance to prefer or not prefer traveling by rail. Stating that 0.08 people actually use rail service in the U.S. is more largely due to the fact that it is simply not available and using that to prove public attitude towards any kind of rail system is just intellectual fraud. I think you could have made just as persuasive an argument without resorting to these techniques. I see that reference is made to Japan and China's huge debt related to high speed rail but I see no mention of the many bailouts the U.S. has given to certain airlines not to mention what a complete ordeal it is to fly now a days. To put it simply all I see here is another conservative backed up against the wall and grasping at any straw that comes his way. I see no mention of President Bush signing off on that 10 billion airline bailout in 2001 or the many trillions spent on war. How can a proponent of truth not at least mention Spain's very successful rail system? I never see any conservatives mentioning the patriot act either, one of the most unconstitutional acts of any president and one of the most frightening. You think the conservative politicians have got your back but when your back is turned is when you are most vulnerable my friend. The wolves aren't outside huffing and puffing they're breathing down your neck. This post is about rail travel in the United States. It's not about airline bailouts or war, and the last time I checked, Spain was bankrupt with a 25% unemployment rate. Rail usage statistics reflect not only the “popularity” of rail travel but also geography of the country. “For instance, the United Kingdom is a relatively small, densely populated country where many more short journeys are made compared to a larger, much less densely populated country such as the United States. So where rail travel might be appropriate in the Northeast, its usage is virtually immeasurable (according to the CBO) for the rest of the United States. Faster trains won't make rail travel any safer, and upgrading an obsolete mode of transportation won't make it any more popular. We already have AmTrak, which is a National rail system, but not many people ride it, and it has required a bailout every single year since its inception. Unlike most people, I have travelled by AmTrak, many times, and it is much more expensive than flying or driving, and the idea being proposed would make it even more expensive. In my opinion it's a waste of money. Did you see my post on Evacuated Tube Transport? At 1/10th the cost of high speed rail, and 1/4th the cost of a freeway, with top speeds of 370 mph intrastate and 4,000 mph interstate/international, silent, safe, and faster than jets, ET3’s six passenger frictionless magnetic levitation capsules are far more viable than any other form of transportation on the horizon. Why go back to rail travel, when technology offers faster, safer, cleaner and more reliable modes of transportation for a fraction of the cost? See http://larrymwalkerjr.blogspot.com/2012/04/evacuated-tube-transport-silver-bullet.html.